Managing a to-do list for an individual is a fairly straight-forward process. Write down all the tasks you need to do with their due dates. As you work, mark the items off as they get completed. When you’re done with the items on your list, you’ve completed your to do list. Sure, there’s been some modifications, with systems like Get Things Done helping people better manage their responsibilities. But overall, folks seem to have a fairly good grasp on to-do management. Apps are basically check-lists with options. However, that’s often not enough to handle a more complicated project. If you have a team of people working on a long-term project, you’ll want to use project management software, like Merlin Project Express. Merlin Project Express is a far cry from a simple to do manager. It goes beyond a basic checklists of tasks to accomplish with optional due dates. Instead, it enables project managers to get a bird’s eye view of a project’s plan. The application is designed to manage long projects with multiple phases, tracking budgets and resources to plan for success. Merlin can help you get organized from start to finish, help you estimate required time, resources and finances for a given project. If you manage a team of people people working their way through project focused workflows, you’ll find that Merlin Project Express is more than up to the task of helping you plan and organize that process. We should note that the version of Merlin we’re reviewing is a simplified version of the more powerful Merlin Project. Merlin Project is a incredibly capable project management tool in its own right, but it might be overkill for those that either work on projects infrequently or don’t need the full power of Project’s serious (and expensive) management capabilities. If you want to find out the specific differences between Merlin Project and Merlin Project Express, you can take a look at the software’s breakdown comparison chart of features. Merlin Project Express takes one of the most useful features of Merlin Project—Gantt charts—and builds the app entirely around it. A Gantt chart is a bar chart that illustrates a project’s schedule. It displays project dependency relationships, or the relationship between completing one task and beginning a new, by using the vertical axis. Using the horizontal axis of the graph, a Gantt chart shows how long it takes a task to be completed, making estimating overall project length a lot easier. 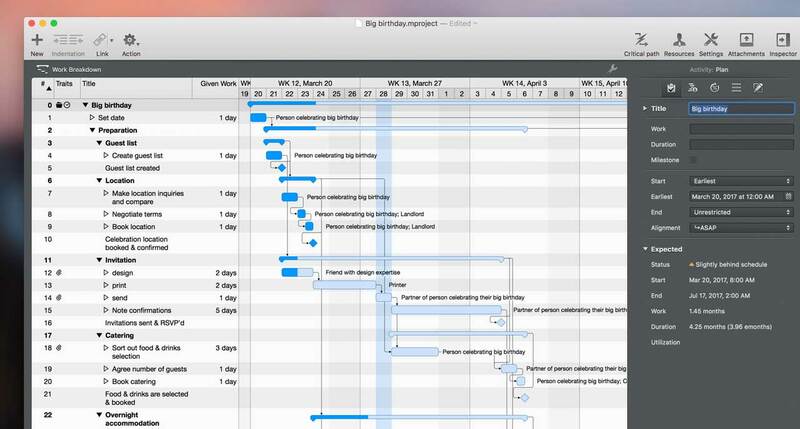 Merlin Project Express runs entirely on Gantt charts. Project Express uses a beautiful, cleanly designed interface with click-and-drag tools to make editing charts easy, and includes enough options for small to medium scale projects. Other features, like budgeting, are more prominent features in Merlin Project. However, you will find some financial tools in Project Express. For tracking project status and work assignments of a small team or department, Project Express should provide enough tools to get you to the finish line. Resources are an important part of Merlin’s Gantt charts. You use Resources to indicates the people and resources you have available to complete the project, and then assign them to specific tasks within the work breakdown. Merlin Project Express also allows tasks to be assigned to individuals workers. 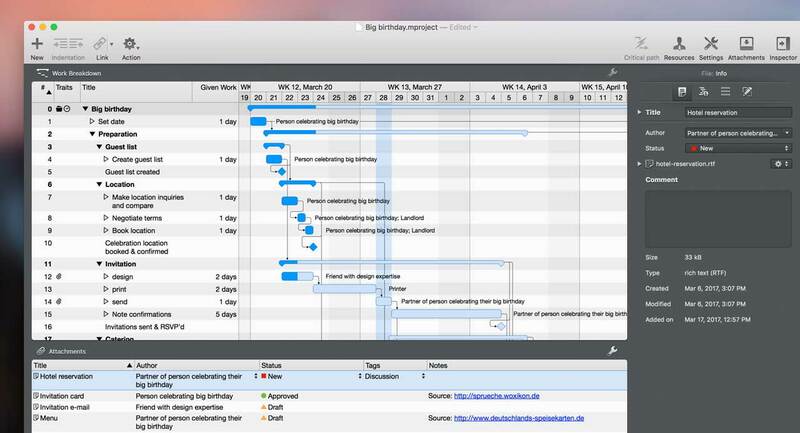 By entering workers in the Merlin Project Express database, you can link them to tasks in your Gantt chart. These folks get added as Resources, which can be attached to specific tasks. By managing your resources and assigning folks correctly, you can identify whether you have the necessary requires to complete the project by the project’s deadline. 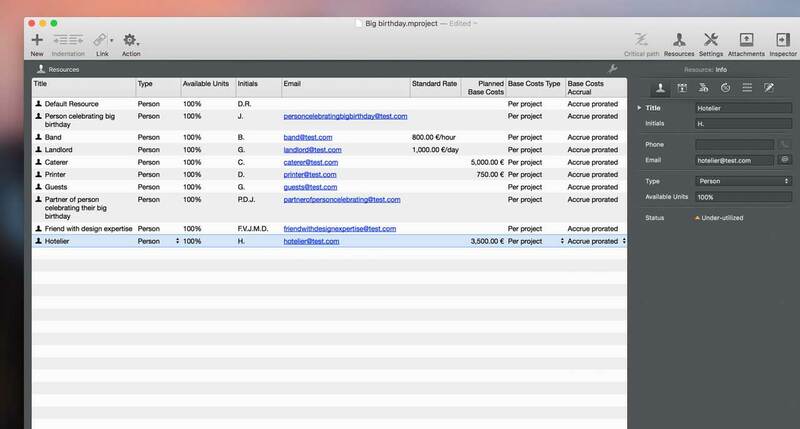 Attachments can also be included with Project Express. You can pin necessary files to your tasks, making them available when relevant. These files are stored within the overall project file. This keeps everything together, making it easier to backup or manage data. Merlin Project Express is a powerful, if simplified, version of Merlin Project. It makes up for the reduced feature load by being far cheaper and more accessible, with a reduced learning curve. If you’d like to try out a more organized project management lifestyle, Project Express is a great way to get started with that. And if your teams are small and your projects simple, you might find that’s it’s enough. You can get Merlin Project Express and a ton of other amazing apps with Setapp. 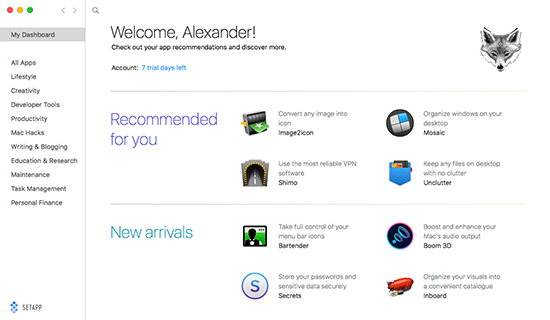 With a subscription to Setapp, you don’t just get Merlin. You also get access to a ton of other value Mac apps like iStat Menus, Bartender, Boom 3D, Gemini, Unclutter, Disk Drill, CleanMyMac and many more. The collection of available apps is impressive and wide-ranging, and only requires a $10 per month subscription to access everything. You can also install the client app for a free, 7-day trial of all the installed applications. You can learn more about Setapp from their website, or download the app to see what’s currently available. More apps are being added all the time, so check back frequently.